Atlantic GMAT > Atlantic GMAT Blog > GMAT Strategies > GMAT vs. LSAT: Which Exam is Harder for You? GMAT vs. LSAT: the battle of the standardized test titans! I'm a GMAT tutor but I have also done plenty of LSAT tutoring and am very familiar with the LSAT having taken it twice. I also use the LSAT to help my GMAT tutoring students slay the verbal section. If you are curious about how the different sections of the LSAT and the GMAT stack up then this is the article is for you (take a look here for a GMAT vs GRE smackdown). Both the GMAT and the LSAT have unique challenges. Which is the harder test? Read on as we analyze their anatomies and suggest a study method for people pursuing joint JD/MBA programs (breaking news: GMAT accepted for Law School at Upenn starting fall 2018). If you're looking for suggestions on using the LSAT to boost your GMAT verbal score you might take a look at this article: LSAT for GMAT. The LSAT is the test that you take in order to be considered for admission to American Law Schools. It is a pen and paper test administered 4 times per year. The LSAT is now (as of July 2019) a test administered on a computer. Well, actually tablet. And now it is administered 9 times per year. Even though the LSAT has gone digital it's not adaptive and still retains an old school format. Why is that? Well, you can skip around the section that you are working on. Question #7 not working for you? Skip to #8 and come back to #7 later on. Most people are really comfortable with this format. And why not? You can take the test in any order that you wish and if you have an epiphany about a question that you’ve already answered you can return to it. In order to be considered for a great majority of MBA programs you need to take the Graduate Management Admissions Test (GMAT), a computer adaptive test administered 365 days a year (although you can only take it once every 17 days). The GMAT is administered on a computer. So no pen and paper. No skipping questions and coming back. No changing answers once you’ve confirmed them. So not only are your answers written in stone but a computer algorithm determines the questions that you see based on your previous responses. Most people are nonplussed by this format. Understandably so. Unequivocally: the GMAT format is tougher than the LSAT format (here is some advice on tackling the nuances of GMAT Timing). Furthermore on the GMAT you do more mental acrobatics as each GMAT section has several different question types coming at you at random as opposed to each LSAT section which has only one question type. Be prepared! Both tests have a classic Reading Comprehension section. Read a passage and then answer questions based on what you've read. Simple right? Well, both the LSAT and the GMAT have a way of picking some pretty boring and obscure passages and pairing these passages with sneaky questions. LSAT Reading Comprehension: The LSAT has 4 looooooooooong (400-500 words) Reading Comprehension passages. You are allotted 35 minutes to complete the questions. GMAT Reading Comprehension: The GMAT has 3-4 reading passages that range from approximately 150 to 350 words. The number of questions varies but expect around 14 12 (in 2018 the GMAT was updated and shortened a bit). You have approximately 25 22 minutes for these. The LSAT wins here. The passages are longer and denser (think War and Peace (LSAT) vs. the Great Gatsby (GMAT)). You have less time per question, and in general the questions are more subtle. On the LSAT it's not uncommon for weaker readers to skip an entire passage in order to have time to focus on the other three. If you are not a strong reader then you may feel severely threatened by the LSAT Reading Comprehension. However, it does provide some great practice for you GMAT achievers out there. LSAT Logical Reasoning: 2 sections, 25 questions, 35 minutes per section. GMAT Critical Reasoning: Approximately 14 12 questions in 25 22 minutes. The LSAT wins again. The LSAT tests you with longer, denser, and more difficult questions; a greater variety of question types such as parallel reasoning and parallel flaw; and gives you less time per question. If you are not so hot at Logical Reasoning/Critical Reasoning the LSAT will be a very tough test for you as this section is worth a hefty half of the final result. Again, for MBA hopefuls looking for GMAT verbal perfection the LSAT Logical Reasoning/Critical Reasoning is excellent practice. The GMAT student featured in this debrief, a GMAT tutor resigns, thrived on this super tough LSAT practice. I'm taking a bit of a leap here and comparing the LSAT Analytical Reasoning (games) to the GMAT Quant. Why not right? The LSAT has 4 logic games serving up 25 questions to be solved in 35 minutes. These range from relatively simple ordering puzzles to obscure spatial arrangement. Some consider the games the easiest part of the LSAT. Others find them extremely difficult. On the other hand the GMAT Quant is broken down into two question types: the familiar multiple choice problem solving and the GMAT only specialty Data Sufficiency. You have 62 minutes for 31 questions. The timing is much tougher on the LSAT. Yes there are LSAT geniuses who blast through the games in no time but for most of us it is a rather intense amount of time pressure. Also, each group of LSAT games is centered around one puzzle (almost like Reading Comprehension, a group of questions centered around one passage). So if you don’t understand the puzzle you're doomed on a whole squad of questions. At the end of the day though there are really only two major basic game types - ordering and grouping - and very little content to memorize. You need to know a fair amount of content to succeed on the GMAT Quant. That said, most GMAT quant content is relatively basic math from your early teenage years. Though the underlying content isn't the challenging part. The GMAT is always inventing new ways of presenting the material. So even though you have memorized formulas you may have a tough time identifying where and how to apply them. The GMAT gets the edge in toughness do to the breadth of the material covered and the infinite ways in which the GMAT scientists can phrase quant questions (GMAT Question of the Day is an excellent way to practice a variety of GMAT Quant Questions). Although the LSAT Analytical reasoning does test similar skills as the GMAT quant does most non-math people would probably prefer working on the games. Not to mention that the games sections tend to arrive in a predictable format and only comprise one fourth of your LSAT score whereas the quant section makes up a full half of your GMAT score and for some MBA programs has a heavier weight than the verbal. The GMAT has a grammar section like that of the SAT/ACT. You pick the best sentence from 5 variations. While some people struggle with SC it is usually the easiest part of the GMAT verbal section to improve. The Elements of Style is a nice grammar primer for GMAT Sentence Correction. You can pick it up on Amazon (or your local bookseller). There's no LSAT equivalent and again for most people it's not the most challenging section of the GMAT so I'm going to leave it out of the comparison. The biggest difference here: you have to write the LSAT essay by hand. The LSAT essay is no longer done on test day. It's a "take home" essay that you do at your leisure in the comfort of your own home up to a year after taking the test. That's a slight advantage for LSAT as it makes test day shorter. For most people the actual writing of the essays will be very similar. The other thing to consider is that the LSAT/GMAT essay's don't count for much of your application to law school or business school. And, given that it's now a "take home" essay, the LSAT one probably counts for even less. IR combines Quant and Critical reasoning. Nothing terribly new going on here except that the format is more interactive and you can use a calculator. It’s tough to judge the relevancy of this section because as of 2019 the IR is still not a major factor into admissions decisions. For the sake of this comparison let’s pretend that the IR doesn’t exist. The LSAT is a bit easier to study for than the GMAT. Why? LSAC (the creators of the LSAT) has released almost every LSAT ever administered. Yep. Pretty epic. So basically you have an endless amount of official practice tests (over 70 and growing!) to build your LSAT skills and gauge your progress. And the LSAT Prep Tests are affordable - a ten pack for a mere $27.32 (shipped)!. GMAC is very stingy and secretive with GMAT questions. So there are only 6 official practice tests available. Yep, only 6. Two of those 6 are free (sarcastic applause for GMAC). The other 4, contained in Exam Pack 1 and Exam pack 2 will set you back $39.99 a pop. 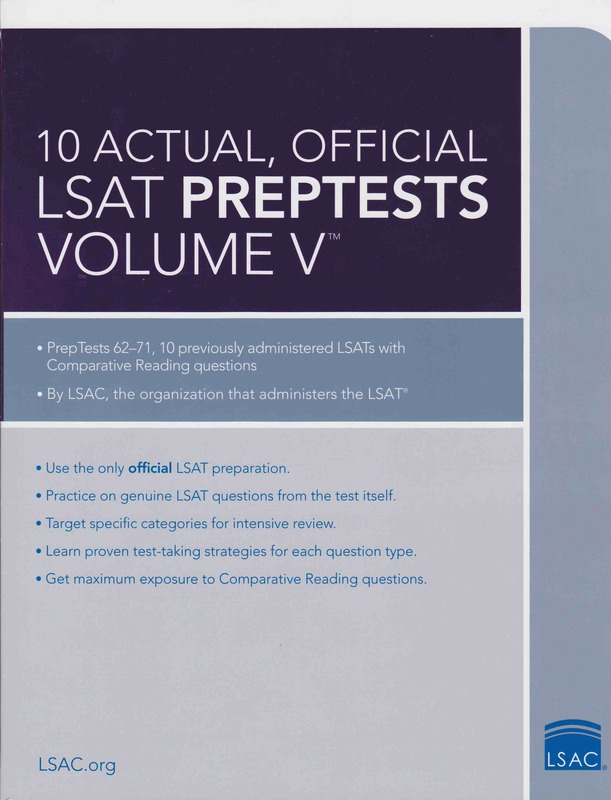 There's also the new Khan LSAT prep which is free and has thousands of official LSAT questions. GMAT and LSAT scores are calculated differently but share some features. They each have a scaled score (measure of absolute ability) and a percentile score (a relative measure of your ability vs the group of test takers during a certain period of time). GMAT scoring is more nuanced. The exam algorithm assigns a sub-score for each section, the quant and the verbal. Those sub-scores are then combined through some secret formula and converted to your composite score (the one that most people refer to as their "GMAT score") from 200 to 800. The LSAT just tallies how many questions you got right in all of the sections and converts that to your scaled score which then has a percentile score associated with it. The LSAT scaled score ranges from 120 to 180. One interesting feature of LSAT scoring: LSAT percentiles go out to the 10ths digit so you can score above the 99th percentile up to the 99.9th percentile. Yeah. GMAT percentile scores are rounded to the nearest digit maxing out at the 99th percentile. Here's a chart for LSAT to GMAT score conversion. I've taken the GMAT and LSAT multiples times; extensively tutored each test; and solved thousands of questions from each of them. I can say with confidence that there is a correlation between how you score on one vs the other especially at the upper end of the scale. Why? Well, if you're killing it on the GMAT or the LSAT that indicates ridiculously strong reasoning skills that will help you float to the top of any reasoning test regardless of the specific content. The LSAT and GMAT are both testing your reasoning skills so if those are sharp expect to do well on either exam given a certain level of studying. Never been a great standardized test person? Then it's possible that the specific content on the GMAT or the LSAT will appeal to you more and be easier to prepare for. In that case there will likely be a bit less of a correlation between the exams. That depends on you. LSAT = tougher verbal, GMAT = tougher Quant type thinking. Let's break this down based on what you occupy yourself with on the subway. Do you read the New Yorker? Well, you are probably an LSAT person. Are you doing Sudoku? GMAT all the way. If you are not a verbal person, don’t read a lot, were never good at reading comprehension then the LSAT may be total hell for you as there is a massive amount of reading and some pretty serious time pressure. If you have always struggled with math and don’t enjoy puzzles then you may despise the GMAT. Summary Fantastic at quant? GMAT may be your test. Great at verbal? LSAT is dominated by verbal reasoning. Only applying to the University of Pennsylvania Law school? Congrats: now you can use the GMAT to apply to law school. For all others my suggestion is this. Study for the LSAT first (and take the test). This way you'll get your verbal in excellent shape and shouldn't have much work to do for your GMAT verbal. Then take another 6-8 weeks to do GMAT Quant and Sentence Correction (you can find some GMAT study advice in the GMAT Study Schedule and in Essential GMAT Study Skills). At this point you can also do the toughest GMAT verbal just to acclimate to the specific flavor of GMAT verbal questions. Happy Studies!